The odds of becoming a professional athlete in America are extremely slim. Many children grow up playing T-ball, eventually graduating to Little League and high school baseball. Some even grow up to be college ballplayers. However, the odds of a high school baseball player in America going on to one day be drafted by a Major League franchise is about 1 in 200, or around 0.5 percent (1). While overcoming these odds alone is extremely impressive, Michigan native Ron Leflore overcame much more. He transcended the walls of Jackson State Prison to take his place on the fields of the big leagues in one of the most inspiring sports narratives of the twentieth century. Born on June 16, 1948, Ronald LeFlore, as number three of four sons, began his life in Detroit, Michigan. The son of a blue-collar auto factory worker and nurse, Leflore’s early life was not easy. His father battled alcohol abuse, and the family lived in an area in East Detroit where crime was extremely common. Growing up in such an area would have great influence on young Leflore, as he often skipped school and fell into drug use and a life of crime of his own. In fact, in his autobiography Breakout: From Prison to the Big Leagues, he remarked, “Stealing was my specialty. As far back as I can remember, I was stealing things and getting away with it. … Every time I went into a store I would steal something, even if it was just a rubber ball or one of those ten-cent miniature pies, just to show the other kids I could do it” (2). Eventually, these petty crimes would turn into something more serious. A 19-month stint in state reform schools as a teenager did little to help him correct his path in life. Finally, on a winter night in 1970, LeFlore, while high on heroin, and two others decided to rob Dee’s Bar in Detroit. LeFlore was in the possession of the firearm used to commit the crime and was eventually given a 5-to-15-year sentence at Jackson State Prison for armed robbery (3). Leflore began his sentence in April of 1970 and definitely did not get off to a great start. In fact, most of his first year was spent going in and out of solitary confinement. One place he did find solace, though, was the baseball diamond. According to multiple sources, Leflore had no affiliation with any kind of organized baseball up to this point. However, given his statistics, it would be difficult to tell. According to the Leflore himself, he would bat .469 in 1971 and .569 in 1972 (4). It was in doing so that he would meet another inmate by the name of Jimmy Karalla, who, through a connection, was linked to then-Detroit Tigers manager Billy Martin. Martin would then visit the prison in the spring of 1973 and offer Leflore a professional tryout mere months later. 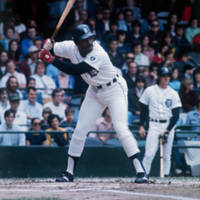 In July 1973, as a result of continued good behavior, Ron was released and immediately signed to a contract with the Tigers. He would play his way through the minor league circuit, experiencing many of the sports’ firsts at the highest level. However, talent would prevail, and by 1974, as a result of injury to a player in the starting lineup, Leflore would see big league action. Just making it to the pros would have been an extremely impressive feat. However, that was not what would be the case. The main selling point of Ron Leflore was his outstanding speed. 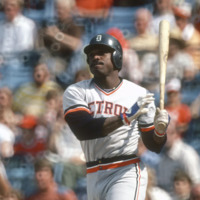 In fact, he stole 455 bases in his professional career and actually lead the American League in single-season steals, as he stole 67 for Detroit in 1978. He also hit over .300 multiple times in his career and has two of the longest hitting streaks in Detroit history at 27 and 30 games (5). 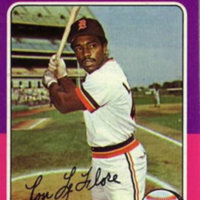 Leflore exceeded even the wildest of expectations as he was named to the 1976 American League All-Star Team, where he would succeed in recording a hit in his first appearance at the plate. In 1979, however, things would take a turn for him. As a result of managerial changes and a continued suspected drug problem, Ron was traded to the Montreal Expos. While he would go on to lead the National League in steals with 97 in 1980, his best years were behind him. His cocaine and heroin addictions lingered, and his bad character began to affect others on the team. As a result, Leflore was not resigned as a free agent, leaving for the Chicago White Sox after only one season in Montreal. 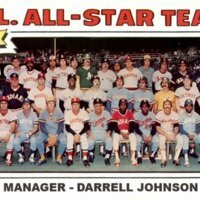 Injuries and the temptations of the big city would eventually get to him, as he played in only parts of two seasons and was out of Major League Baseball by 1983. This was expedited by a 1982 arrest for possession of a firearm and amphetamines, for which he would later be acquitted (6). Over the next few decades, Leflore would have stints in semi-pro leagues and as a coach in a few independent league circuits. He also would attend umpire school and work as a baggage handler at an airport. 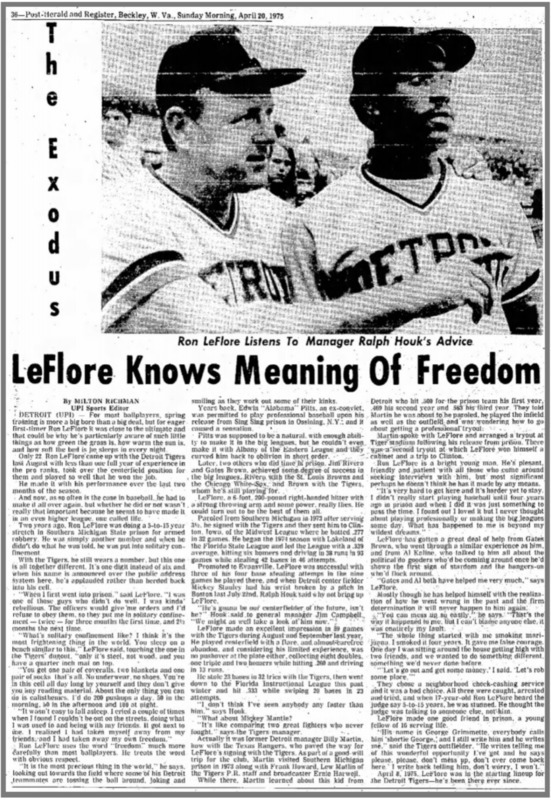 Today, he resides in St. Petersburg, Florida, limping as a result of an amputation of his right leg due to heavy smoking, a cruel fate for whom many call “the fastest Detroit Tiger ever.” Leflore has no health insurance and is living month to month on both disability and his baseball pension. When asked about his playing days, he remarked, “’I made a mark in baseball. Nobody can take that away from me. But I could have made a much bigger mark in baseball than I did. I could have done so much more’” (7). While baseball provided an escape from the harsh realities of his upbringing and his time at Jackson State Prison, his resulting fame was a curse. He never was able to quit heroin or cocaine in time to salvage his career, although he has remarked that those demons are long in the past. However, even with his fall from grace, the fact that Leflore accomplished so much in professional baseball was a feat in itself. Coming from no formal experience with organized baseball and transforming into a MLB All-Star in less than five years is virtually unheard of. The story of Ron Leflore stands as a testament to the great athletes residing in Jackson State Prison and serves as a reminder that life has many twists and turns. It truly is talent that is the great equalizer of man. (1) Cornelius, Emily. “How Hard Is It To Make It To The MLB?” The Huffington Post, TheHuffingtonPost.com, 7 Dec. 2014, www.huffingtonpost.com/emily-cornelius/how-hard-is-it-to-make-it_1_b_5947308.html. (2),(4) Hawkins, Jim. “Former Montreal Expos Star Ron LeFlore down but Not Out.” Toronto Sun, The Toronto Sun, 27 Feb. 2013, torontosun.com/2013/02/26/former-montreal-expo-ron-leflore-down-but-not-out/wcm/fcd44127-c5d7-4236-b260-83b53c275eba. (3) Hofmann, Paul. “Ron LeFlore.” Society for American Baseball Research, Society for American Baseball Research, sabr.org/bioproj/person/8538e00b. (5) Holmes, Dan. “Ron LeFlore: The Fastest Tiger.” Detroit Athletic Company, 20 Nov. 2012, www.detroitathletic.com/blog/2012/11/20/ron-leflore-the-fastest-tiger/. (6) LeFlore, Ron, and Jim Hawkins. Breakout: From Prison to the Big Leagues. Harper & Row, New York, NY, 1978. (7) Merkin, Scott. “A LONG ROAD BACK.” Chicagotribune.com, The Chicago Tribune, 29 Aug. 2018, www.chicagotribune.com/news/ct-xpm-1999-06-02-9906020194-story.html.